Sadly what we smell from our four legged friends is usually only the tip of the iceberg. 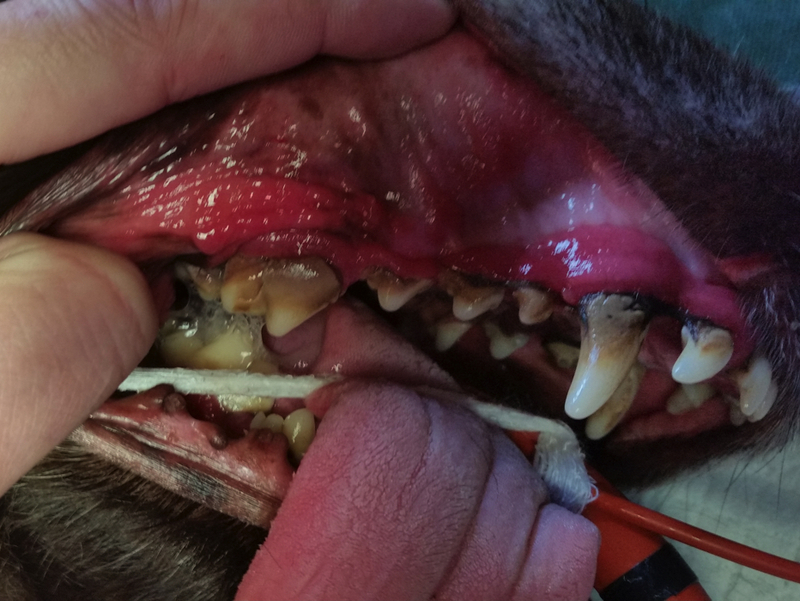 Over 80% of dogs over the age of 5 have some form of dental disease. Bad breath in our pet is not a sign of old age or even normal. The smell is due to a build up of bacteria in the mouth which forms a substance called plaque that sticks to the teeth. Over time, minerals in the saliva harden the plaque into a very hard substance called tartar which is firmly stuck to the teeth. This often looks brown/yellow in colour. This starts silently, with the only sign being a smelly breath. Over time, the real problems develop as the plaque and tartar spread under the gum line. This causes damage to the supporting tissues around the tooth and eventually tooth loss. The problem is, although dental disease is painful, our animals are very good at not showing pain and rarely stop eating. We also know that dental disease is associated with changes in the liver, kidneys and heart due to the bacteria in the mouth. Its especially dangerous in our pets with chronic health problems. The diets our pets eat can be important in preventing plaque and tartar build up on their teeth. In the wild, dogs and cats chew on raw bones as part of their diet. Our feline friends who hunt quite often have less tartar on their teeth than house cats. Speak to our team about specific diets or if you are considering a diet change for your pet. Dental chews are convenient and can have some benefits. Its important to choose the correct size of chew for your pet to reap the benefits. Also bear in mind that some chews have a lot of calories in them and some may be too rich for your pet. Chewing on cooked bones is not recommended as they can splinter and can seriously damage the gut. Raw bones can help to keep tartar off teeth but they can also cause some gut problems and may also chip the enamel and cause dental fractures. This is the best method to keep teeth clean. We recommend introducing brushing to puppies and kittens to enable them to get used to the process. There are several types of toothpaste available which our team can advise you on the best ones for your pet. A guide to toothbrushing can be found at www.petsmile.org. These can reduce the ability of the bacteria to stick to the teeth. They can be very useful for those animals who will not tolerate brushing.